Published every year since 1996, our 10 Key Trends is the only trends analysis that enables you to answer these questions with confidence. That's because our methodology, shown in the report in our unique Trend Diamond, ensures that all the angles of a trend are weighed up – from science through to consumer needs. The growing success of lactose-free brands, particularly in Europe, illustrates the power of serving a niche in the right way. Only 5%-10% of Europeans are lactose-intolerant, but lactose-free dairy brands enjoy loyal customers who are willing to pay premium prices – usually a 100% premium to regular products. Snacks and dairy products are major categories in the kids’ food market – but innovating in kids’ dairy is challenging and the market for kids’ snack products is extremely competitive. This 48-page report looks at routes to innovation in these categories, including new approaches to distribution and marketing – and in particular, marketing to that powerful and increasingly on-line buying group, mothers. 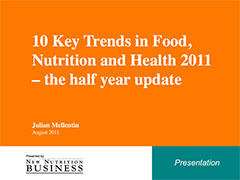 The food and beverage industry’s most-used guide to the trends driving the business of food and health. Published each year since 1996, our long-term forecast enables companies to formulate their innovation and strategy plans around our trends analysis – as many, many companies tell us they do. Cocoa – a "naturally functional" health ingredient at the tipping point? Cocoa has the potential to be a naturally healthy ingredient as successful as cranberries and one that can help create new brands and even new categories. Beverages, dairy and snacks are the areas with most potential, thanks to growing consumer awareness of its health benefits and advances in processing technology that have taken it into new formats. Snacking is the over-arching driver in the food industry, affecting every category. This report examines innovations in format, ingredients and marketing and includes 15 detailed Case Studies of healthy snacking brands (see full list of case studies below). Among the case studies are the three most successful snack launches of the last two years – one of them offering “natural functionality” and fun marketing, another the natural health benefits of fruit, while the third is a brand that has legitimized the idea of snacking at breakfast for slow-release energy. Our annual 10 Key Trends report is the food and beverage industry’s most-used guide to strategy in food, nutrition and health, published each year since 1996. Halfway through each year, we provide a detailed 200-slide Powerpoint update that reflects the latest key developments and features 15 case studies. This report explores the growing opportunities for healthy brands to sell their products through the vending channel in the US – a channel that’s anticipating double-digit growth. It addresses the size and nature of the opportunity and what healthy brands need to know in order to be successful. Among other key factors it addresses pricing, packaging, machine technology, location and branding.